I'm busy wrapping things up with the other division (yeah, they both got sold, but this one wasn't paying my salary). I had a super late lunch, and I just got back from my afternoon snack hangout, Walgreens. I decided to take a crack at one of their non-premium flavors. Their entry level stuff includes neopolitan, chocolate, vanilla, and cookies & creme. Actually, I almost grabbed a pint of their rainbow sherbet, but then went back to my choice of cookies 'n cream. I was so hungry that waiting in line with the ice cream was pretty tough, but ice cream is about relaxing, not about getting worked up on spending an extra 2 minutes in line. Surprisingly enough, the nice lady behind the counter apologized for making my ice cream melt. See? balance has been restored. I told her not to worry, the ice cream is just easier to eat now. So, through the rain and back to the car. Crack open the container, in goes the spoon, out comes the potential goodiness ....and I'm disappointed. Not nearly enough cookie flavor to go around. Occasionally you run into a big chunk, but these generic cookies just don't offer top notch flavor. It's bland, plain and simple. Not much else to say except now I know why it's not a premium flavor. On Second Scoop: Yeah, still bored, this one just doesn't make the cut. I love this Ice Cream for it's bland taste. I don't like overly flavored ice cream or overly flavored food for that matter. This ice cream provides the perfect amount of un-flavoring, and comes at a cheap price. 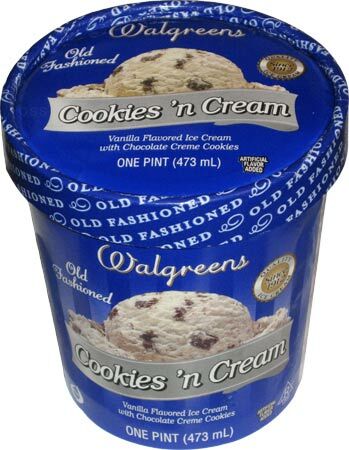 FYI, the "premium" ice creams at Walgreens (which are more expensive) are MUCH better and less bland than their regular flavors. If you're ever in a pinch again, give them a try!